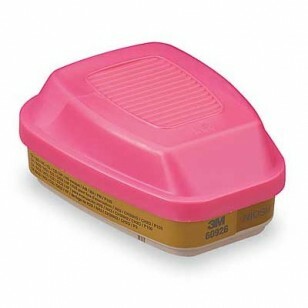 The 3M 60926 respirator cartridges are NIOSH approved against certain organic vapors, acid gases and particulates. Use the 3M Multi Gas-Vapor Cartridges with 3M Half and Full Facepieces 6000 Series and 3M Half and Full Facepieces 7000 Series with bayonet style cartridge holders. When properly fitted, cartridges and filters help provide protection from most chemical contaminants making it easy to standardize any 3M Elastometric facepieces as your brand for respiratory protection. Particulate filter (P100) is permanently attached to 3M 60926 cartridge for easy, one-step assembly. Use in a variety of applications, including petrochemical and chemical processing, utilities, pharmaceuticals, mining and primary metals. When properly fitted, the 3M 60926 cartridge helps provide respiratory protection from certain organic vapors and particulates, chlorine, hydrogen chloride, sulfur dioxide, chlorine dioxide, hydrogen sulfide (escape only), ammonia, methylamine, formaldehyde or hydrogen fluoride at concentrations up to 10 times the Permissible Exposure Limit (PEL) with half facepieces or 50 times PEL with full facepieces. Full facepieces must be quantitatively fit tested to claim assigned protection factor above 10 in negative pressure mode. Do not use in environments that are immediately dangerous to life or health (IDLH). OSHA requires that gas-proof goggles be worn with half facepiece respirators when used against formaldehyde.